Anthony Trollope,The Last Chronicle of Barset, Vol 1. Facing p.7. This bleak and imposing design is Thomas’s first illustration and establishes the anguished tone of the Crawleys’ narrative. 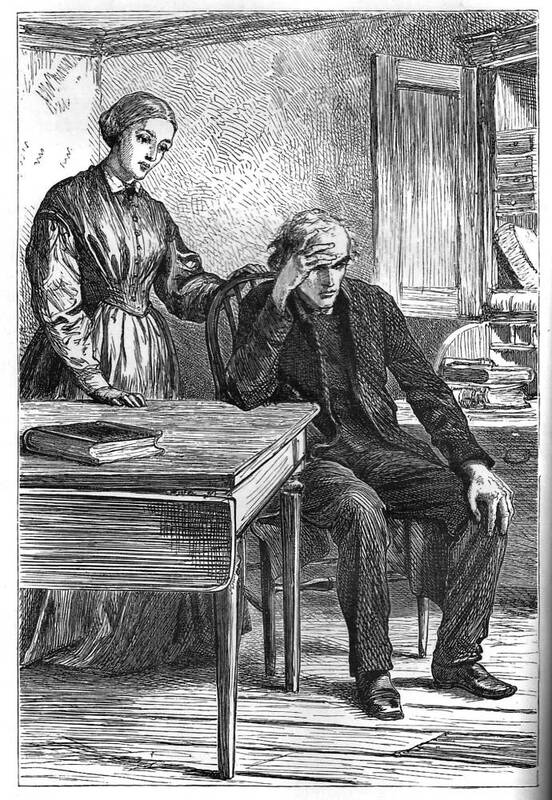 Though modelled on Millais’s earlier design for Framley Parsonage, it shows the reverend and his wife in later years; both have aged and their economic circumstances have declined from poverty into penury. The glum ambience is powerfully conveyed by the worried gestures and glances and the emptiness of the room suggests both material poverty and the emptiness of anxiety. Scanned image and text by Simon Cooke. Anthony Trollope, The Last Chronicle of Barset. 2 Vols. London: Smith, Elder, 1867.